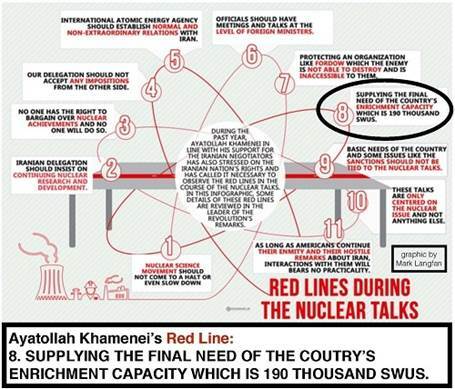 Ayatollah Khamenei’s red line involves weapons-grade enriched uranium for 38 nuclear bombs per year. Iran’s semi-official news agency Fars reported Sunday that “senior Iranian Foreign Ministry officials” had rejected the Washington Post’s report Saturday that claimed the Iran–P5+1 nuclear talks had narrowed the gap in centrifuge numbers, and had instead reasserted the Supreme Leader Ayatollah Ali Khamenei’s red line of no less than 190,000 SWUs, or “Separative Work Units,” and that this would be limited to only 8 years. 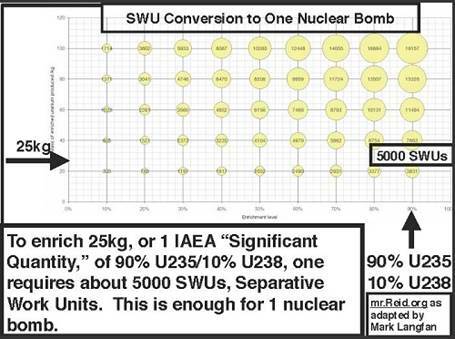 As reported in October by Arutz Sheva, 190,000 SWUs of centrifuge capacity can enrich enough natural raw uranium to weapons-grade enriched uranium for 38 nuclear bombs per year. Uranium is enriched from its natural raw state of a high proportion of Uranium 238, to its weapons grade enriched state with a high percentage of the lighter uranium isotope U235. 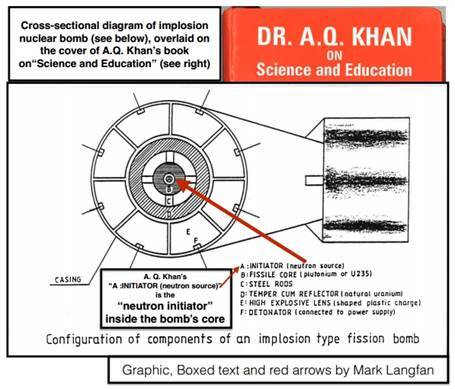 U235 is the isotope of uranium that has three less neutrons in its nucleus and is the isotope necessary for the building of nuclear bombs cores. 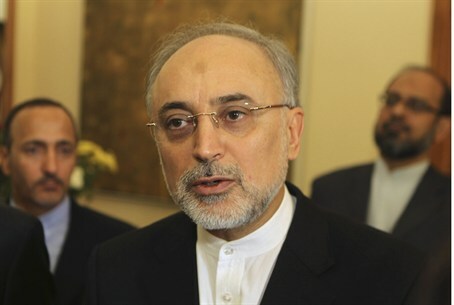 According to the report, Salehi underlined that the number of centrifuges needed for having 190,000 SWUs depended on the type of the centrifuge machines. What Salehi is, in effect, saying, is that with the first-generation, less effective IR1 centrifuges that only produce 2 SWUs per year, Iran would likely need over 100,000 centrifuges to comfortably produce enough enriched uranium for it Bushehr nuclear power plant. But with the advanced, very effective and efficient, fourth-generation IR4 centrifuges that can enrich to 24 SWUs each year, Iran would only need 10,000 centrifuges, which nominally would produce 240,000 SWUs per year. Salehi concluded by reaffirming that "Thus, the hue and cry about the number of centrifuges are deliberate deviations from the reality as we have defined our needs based on SWUs, and not on the basis of centrifuge machines." Israel claims Iran would use its domestic centrifuge capacity to enrich weapons grade uranium for nuclear bombs. The Jewish state has thus demanded Iran have no domestic enrichment capability and would instead purchase already-enriched uranium like many other countries that use nuclear energy peacefully and don’t have domestic enrichment capabilities.